Next time you’re traveling through Green County, Wisconsin on Highway69, why not take a few moments to stop in Monticello and visit the Green County Vietnam War Memorial .The memorial is located near the banks of the Little Sugar River just off highway 69 near downtown Monticello (look for the American and POW/MIA flags flying together on the east side of the highway). At the foot of the flag pole, you’ll find a modest stone monument. You’re now at the edge of Monticello’s scenic Community Park which offers a pleasant environment for reflection or just a good old-fashioned stretch. 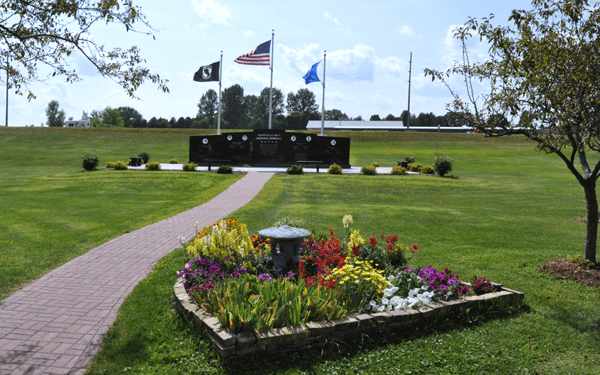 Officially dedicated July 12, 1987, the monument honors the ultimate sacrifice of Green County men in Vietnam and serves as a testament to the price paid by communities, large and small, across America during that era. You can follow the path from the monument a short way to nearby Montesian Gardens which you really should try to visit at least once in each of the four seasons. Across the street from the Vietnam Memorial, you’ll find Lake Montesian and an artesian spring where you can fill up your water bottle with the good stuff for free. The Nicholas Gerber memorial is also across the street and provides a glimpse into local cheese-making history. Editor’s note: The use of the name Viet Nam (with a space) on the monument is related to the country’s actual name in the Vietnamese language i.e. Viet Nam. Vietnam is an English translation.